Touchdown! Field Goal! Safety! These scoring terms have been part of the American football vernacular for well over a century. So, why aren't they descriptive of how the points are scored? There's no "touching down" in a touchdown. Why "FIELD" goal? From where else other than on the field could you score a goal? What "safety" is there for a quarterback as he's violently sacked in his own endzone? In Part 2 of our multi-part series "Football Etymology," AntiqueFootball journeys back to the 1870's to explore the roots of American Football and the scoring terms we use today. The second method of scoring in the 1870's was to drop-kick a "goal from field" during live play. As a team drove the ball towards its opponent's goal, a player in possession of the ball could attempt a drop-kick at any time. A drop kick was executed by dropping the ball and kicking it the instant it rose from the ground. The nearly round shape of early footballs allowed for a more predictable bounce than modern footballs, making the drop-kick possible. The drop-kick is still a legal method of scoring in American football. However, the modern football's elongated shape, which has evolved to improve passing accuracy, has made the drop-kick virtually impossible and obsolete. A drop-kick from the field was referred to as a "goal from field" to distinguish it from a goal after touchdown. In 1883, a goal from field was increased to 5 points and in 1909 it was changed again to its modern point value of 3. While the goal from field may have been referred to as a "field goal" by players, the term wasn't included in the intercollegiate football rules until the 1940's and the goal after touchdown was changed to the "extra point." American football evolved from rugby in the 1870's, and like rugby, points could only be scored by kicking the ball. In the earliest codification of rugby union football rules, a single point was awarded for each goal. A goal was obtained by kicking the ball between the goal posts and over the crossbar of the opponents goal. There were two legal methods to kick a goal, a "place-kick" after either a touch down or fair-catch, and a "drop-kick" from the field. If the touch down was made close to a touch line (sideline), the angle of place-kick could be severe, reducing the probability of a successful kick. Alternatively, the team could choose a "punt out" from the goal line in this situation. In a punt out, the player who made the touch down stood on the goal line perpendicular to the point of touchdown while his opponents were required to line up behind the goal line. The player then punted the ball back to his team into the field of play while his opponents rushed the receiving players. A receiver could make a "fair-catch", by making a mark on the field with his heal immediately after catching the ball. A fair-catch awarded the team a try at goal by place-kick. With opponents this time lined up at the point where the mark was made, the receiving player walked back perpendicular from the mark to a point of his choosing and then placed it down for a teammate to attempt a place-kick for goal. The act of scoring a touchdown in modern football has nothing to do with touching the ball down, but it did in the early game. A player made a "touch down" by carrying the ball across his opponent's goal line and "touching it down" so that it remained motionless on the ground. Crossing the goal line without touching the ball down wasn't a touch down. 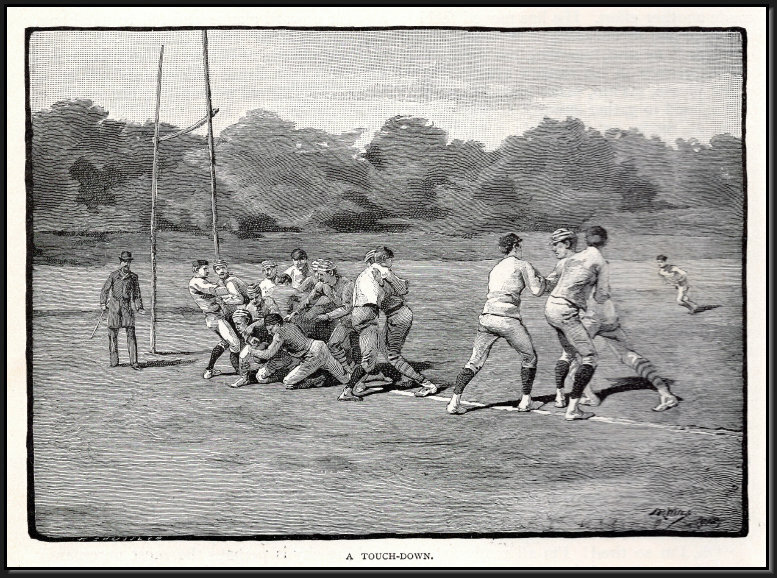 Opponents were free to wrest the ball from the ball carrier (called a "maul-in-goal") until the ball was touched down or stripped from the player. After a touch down, the player who made the touch down brought the ball up to the goal line in a straight line from the spot where the ball was touched down, and made a mark with his heel. From there the player walked straight out with the ball, perpendicular to the goal line, to a point he thought proper. The player who made the touch down would lay prone, holding the ball inches from the ground. Upon touching the ball to the ground, a second player could attempt a kick over the crossbar (a "place-kick") while the opposing team, having lined up along the goal line, could rush the try and attempt to block the kick. A successful place-kick was worth one point. Prior to 1883, a touch down wasn't worth any points. A touch down awarded a team the opportunity to either attempt a goal by "place-kick" or make a "punt out" from the goal line. In 1889, rules changes eliminated the maul-in-goal and the requirement to touch the ball down for a touch down. Despite the fact that a player hasn't been required to touch the ball down for almost 130 years, we still call it a touchdown today. In possession of the ball deep in his own territory, a player could perform a touch down within his own goal for a "safety touch down." Once the safety touch down was made, play was stopped and the player was in effect protected (hence the term "safety.") The player was then permitted to punt the ball to the opposing team from his twenty-five yard line, and play resumed. No points were awarded for a safety touch down. After widespread abuse of the safety touchdown to stall games, the official football rules were changed to award a team one point when it's opponent made a safety touch down. In 1888, the value of a safety touchdown was increased to 2 points. After the rules were changed to eliminate the requirement to touch the ball down, the safety touch down was shorted to the "safety." Between 1871 and 1912 the points values for scoring plays were constantly tweaked to improve the style of play and to make the game more entertaining for spectators. Points for touch downs and safety touch downs were added to the rules in 1883, and scoring values were adjusted in 1888, 1899, 1909, and again in 1912, when the modern football scoring system was adopted.